Great instructional design is focused on one goal - delivering a seamless user experience that helps learners to achieve their objectives. In this post, I'll show you how to use the principles of User Experience (UX) and User Interface (UI) design to create course content learners will love. Good instructional design delivers a great user experience that supports successful learning outcomes - a good day for everyone! User Experience or User Interface? UI is about how eLearning course content looks and UX is about how it feels to use it. I'll start with how to present text as, in most cases, it will be the main element of your online learning content. Because text is central to most eLearning courses, it’s essential that it’s edited and aligned correctly. To support the best reading experience, optimal line length should be between 50 and 70 characters. If you use fewer characters, the text will be too narrow. The reader’s eyes will have to travel from one side of the screen to the other very quickly, creating strain and frustration with longer pieces of text. But if lines are too long and wide, readers will struggle to focus as they move through the text. Avoid using justified paragraph alignment. Justified text blocks can look better in some cases. But varied spacing between words makes text in a justified format difficult to read. Also avoid creating long paragraphs and blocks of text. Chunking, or dividing text into sections, is easier to scan and read, and supports learning. When choosing a font size, I recommend between 15 and 18px for longer pieces of body text. Learners over the age of 40 may struggle to read text in smaller font sizes. Using a smaller font also makes it likely that lines will be too long to read easily. Sans Serif fonts are easier to read onscreen than Serif fonts, and the reverse is true for print. There’s no need to use more than two different fonts in one eLearning project. As most of the font families have different styles (from thin to black), two fonts are usually more than enough. Use a bold or black font style for headings, and combine with a slightly darker color and larger font size. That kind of contrast helps to break up text, making it easier for learners to read. 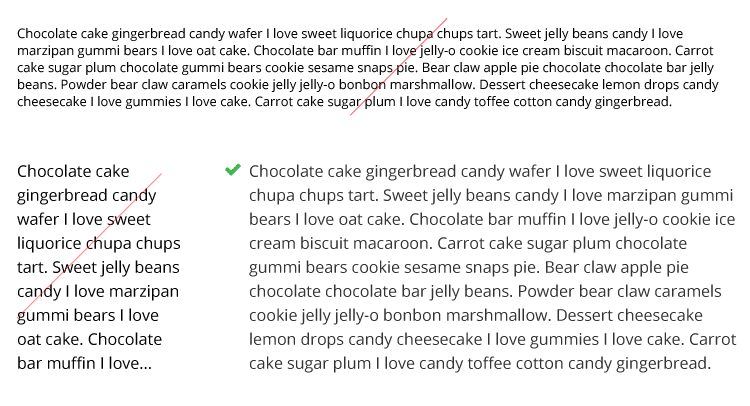 Consistency is critical to all elements of instructional design, including text editing. To stay consistent, begin by defining and documenting your standards and design elements for different types of texts. And then apply those rules throughout your eLearning project. There’s no hard and fast rule for choosing the "right" color for eLearning course content. I recommend selecting your primary color based on the topic covered in your course. For example, if the course is about “flower farming”, the primary color should be green. The secondary color should be pink - not only because it suits the subject of the course, but also because green and pink are complementary. Mother nature knows a lot about color combinations! There’s no need to use more that 2 or 3 colors in one eLearning course. All of the main colors you select will have tints and shades that can be used for various design elements. It's also important that your use of color is consistent throughout your eLearning project. One exception to note is that multi color usage can be helpful if you want to distinguish multiple sections by labeling them with additional colors. In order to use the harmony rules of color combination effectively, it's important to know that colors have three values: hue, saturation, and brightness (or luminosity). Hue is the term for the pure spectrum colors, which appear in the hue circle, rainbow, or color wheel. Theoretically, all colors can be mixed from three basic hues, known as primaries. Saturation describes the purity of a color. High saturation colors look rich and full. Low saturated colors are pastel. Luminosity describes the lightness or darkness of a color. Light colors are called tints and dark colors are called shades. It's useful to understand these values as they can be used to create contrast in color combinations. Contrast can be created with the hue value by using opposite colors in the wheel (known as complementary colors), or by using colors of contrasting saturation or brightness. To get to know these rules and to find useful combinations for your eLearning project, play around with the color wheel. It's easy to find good combinations on the color wheel by applying one of the harmony rules (analogous, monochromatic, triad, complementary). Or you can search for color combinations that have been posted by designers. Graphics and images should only be included in course content when they support the learning experience. Overusing visual content can distract the learner and undermine objectives. The use of images and graphics should be careful and deliberate. Visual elements should never be included simply to fill white space. The consistency rule applies to visual content too. It's important not to mix different styles - especially with graphics that are used for visual support, for example characters in a scenario. If you use a style of character in a course, reuse the style as appropriate throughout the project. The purpose of white space in instructional design is not just to be filled. White space is in itself very important - it enhances readability for learners. The composition of your course content will be made up of design blocks, which may be text blocks, UI elements, or videos and images. Hierarchy of elements: Define what’s important on your page and enhance it with positioning or sizing. Use enough white space: The more important a design element is, the more white space it requires. One of my favorite design principles is “KISS”, which stands for Keep it Simple Stupid. That's not to say anyone is “stupid”. The idea is to keep things so simple that it seems obvious. Although the KISS design principle is usually used for software development, it can also be applied to improve user experience in eLearning. Keep KISS in mind when you're reviewing eLearning content. Remove unnecessary design elements that don't have a specific function or distract from the overall design style. Applying KISS will keep your layout clean and enhance the readability of your most important content. And now you’re all set to create effective instructional design that supports user experience and learning outcomes.